Mythgard Card Game Coming from Former Blizzard/Gazillion Devs | Nerd Much? In the continually growing collectible card game genre, a new competitor is entering the mix. Rhino Games has announced that their unique take on the genre is coming next year, with a close beta launching in January. Rhino Games is comprised of veteran developers that have come from iconic studios such as Blizzard and Gazillion Entertainment. Peter Hu and Paxton Mason co-founded the new venture. Hu is known for his work at Blizzard, specifically Diablo 2. Mason was working within the Google X team before departing to build Rhino Games with Hu. And to be fair, Mythgard is looking pretty robust at this point. The collectible card game features 6 different factions across a massive card collection of over 330. There are multicolor decks available that each portray some truly gorgeous art. Like most card games, each card is unique. Some summon mission, others cast spells, and there are those that just attack with brute force. Rhino Games says that Mythgard takes the depth of the Magic series and pairs it with the pacing of Hearthstone. They tease an “extensive” single player campaign for those interested in going solo. But Mythgard also has a Draft mode, Ranked mode, and a 2 vs. 2 mode. The developers also promise cross platform play upon release. 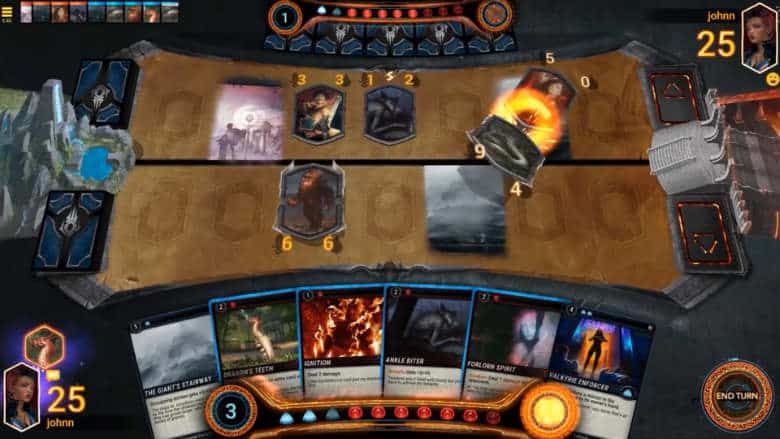 A release date hasn’t been announced yet for Mythgard, but the card game will be accessible via web browser, Steam, Google Play and the App Store. For more information and sign ups, head to Mythgard’s site here.